There are myriad reasons why the connection between those involved in a marriage, or similar relationship, might become broken: financial hardship, the death of a child, addiction or, in the case of Graham and Quinn Wells, infertility. 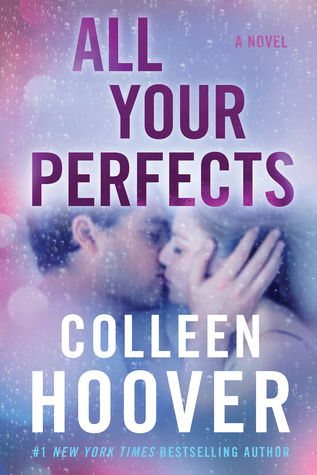 While Colleen Hoover has become famous for her thoughtful, emotionally-charged romance writing, I would hesitate to classify this as a romance; All Your Perfects is a powerful story that describes an especially challenging series of events and the resilient couple who must decide how to proceed. I've never considered myself a fan of the romance genre; however, I was encouraged by a friend to try one of Hoover's books on audio, when I was having an especially tough time finding engaging material for long runs and my boring work commute. Her writing is worth all the hype, and I can certainly understand now why her fan base is as incredible as it is! Without spoiling any of the good stuff, I'll just say that this story really resonated with me; my husband and I have certainly been through some challenges that, I would venture to guess, have not plagued most couples during their first ten years of marriage. Hoover handles this story both carefully and compassionately; I could hardly put it down. For those who may be, or may have been, struggling with infertility, please note that it is a prominent theme in this book; I can only imagine that the way in which the experience of Graham and Quinn unfolds might offer some support in its honesty and relatability. I am now one of Hoover's adoring fans and I will certainly look forward to more of her work; I intend to continue working my way through her hefty backlist, via audio, when I'm at a loss for a good listen!